As a precursor, please do not see this report as a negative or so-called sceptical (Read: Non-believer) of the ghostly stories of the tunnel. It's just a note of the variations and the absolute conviction of the teller's of this tale about the "truth". The "Screaming Tunnel" is a definite legend and a great story! Our first reporter had the tunnel closer to Hamilton than Niagara and then the City of St. Catharine's claims it but so does Niagara Falls and Niagara-on-the-Lake. Truth is, it's sort-of in between ALL of these and can be claimed by all of them. Sadly, though, people (and we've had many,) are very adamant about the "truth" when it comes to the story. We have had over sixteen variations all of which we were assured were the true versions of the ghostly legend of "The Screaming Tunnel". Like our Toronto story on Grenadier Pond, here is another "drop down box" legend that you can play with to see the variations. Some things stay the same BUT other things change during the telling. All, without a doubt, have been claimed as true by the contributors. ...the house located on the hill behind the tunnel. she finally succumbed to her burns and died. she was raped and set on fire to cover the crime. she was set on fire to deny custody to someone else. she was cursed by an "evil entity" and burst into flames. she was murdered and the corpse set on fire. hear a scream and the match/lighter will blow out. hear a scream and smell burning flesh. hear a scream and invisible feet will run out of the tunnel. have the match blow out no matter if there's no breeze. The issue seems to be that people are VERY territorial about the "Screaming Tunnel" and we have managed to source out ONE thing to help straighten our the stories and eliminate some of the versions. 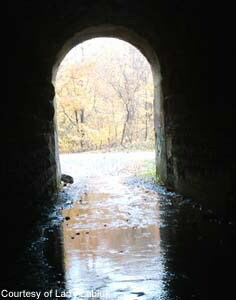 The tunnel (the one near Warner Rd. which is the most often quoted "real" one) was built by the Grand Trunk Railway company just before the outbreak of World War One in their grand scheme to have a railway that ran the same grounds as the Welland Canal. Sadly, the project was abandoned due to financial issues and then totally given up with the outbreak of the war. 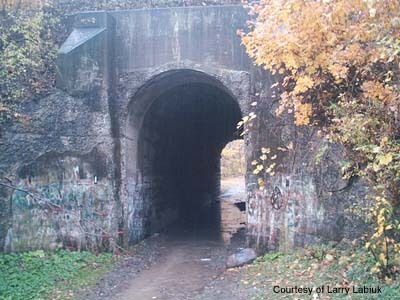 The "Screaming Tunnel" is one of a few of these railway tunnels to nowhere made for a railroad line that never existed. We are still looking for a deed or property right to a house "behind" the tunnel but so far, we've come up blank. A "ghost expert" in Niagara-on-the-Lake has described the tunnel as "The Stinky Tunnel" and after visiting it, we would agree. The natural smell of sulfur is heavily prevalent. Like many spots, there is a chance that the story is a wonderful legend made up and repeated for many years by the hoards of teenagers that still frequent the spot as a "drinking" location. Empty beer and other alcoholic beverage containers litter the ground and scribbled graffiti on the tunnel walls contribute to the rather negative atmosphere of this odd, old tunnel. The tunnel's reputation as "spooky" place was established even more when David Cronenberg used the tunnel as a backdrop in a scene in his film, "The Dead Zone". Until we find a police report or something to solidify one of the legends, the "Stinky Tunnel" remains a legend of Niagara that has been passed down from literally generation to generation. Is it haunted? Maybe. Is it a WONDERFUL legend and a lasting story passed along? You bet! Does it REALLY smell in the tunnel. Yup. My wife and I went to the 'screaming tunnel' yesterday (again) because something wasn't right. Everyone talks of the little girl that was caught on fire.......we walked around the immediate area in search of the old foundation but came up empty. Many people say the foundation is still there. How far away was the old farm house from the tunnel? could a person, or a little girl it this case run that far while ablaze? the story goes.....a little girl was in the house when it caught fire, the little girl must have caught fire in the house. She would have had to find her way out of the burning house run down the hill and in the tunnel, all while on fire. question #3 - what is the longest a stunt person has burned with a controlled burn with fire retardant clothes and protective gear? It is a good story at best, but fact........ to many unanswered questions and realistically........almost impossible. Webmaster's note: These are excellent questions, and we thank the writer for contacting us, and sharing their experiences, and thoughts on this location.